Is your ride full of rattles and road noise? Do your panels buzz when the bass drops? You've spent your hard earned cash on an audio system that rules the neighborhood; now give your car the power of GTMAT Automotive Sound Deadener! Proven to reduce unwanted noise and increase bass quality, GTMAT High-Performance products are the new standard for Discount Sound Dampening. Just one layer of our GTMAT Deadener is enough to double your stereo output quality, at nearly half the cost of the leading brand! Not only will you hear an amazing improvement in sound quality and acoustics, but you will FEEL it as well! GTMAT makes your ride feel more solid, and helps block heat transfer, turning your humble ride into a righteous sound machine! When it comes to choosing a discount sound deadener, we know you have a choice. When you choose GTMAT, your satisfaction is 100% guaranteed with our superb noise deadening material! All of our products come with a 90 day money-back guarantee and a lifetime product warranty! 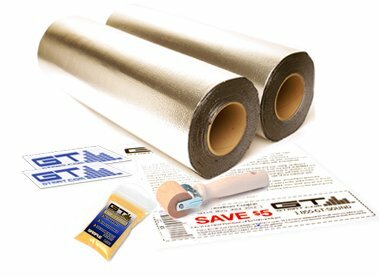 GT-MAT Sound Deadener is the perfect automotive sound insulation. The rubberized compound absorbs sound energy reducing distortion noise and eliminating panel rattle. Additionally, GTMAT adds mass to all applied panels, thus lowering the audible vibration resonance. Just one layer of GT MAT sound insulator will reduce up to 5 DB of unwanted noise, thus making your ride sound quieter, and your stereo sound sublime! Because GTMAT is easy to apply, is permanent, creates no mess, and half the price of the leading brand, it is the obvious choice when choosing a sound dampening solution! Order GTMAT today, install it tomorrow, and finally hear what everyone has been talking about! GTMAT Sound Deadener adheres to almost any surface instantly, and is pressure sensitive. The harder the pressure of application, the stickier the bond. Clean, grease-free surfaces provide the most durable applications. In general, the warmer the temperature, the tackier and more pliable the adhesive will be when handling and applying. Recommended application room temperature is between 50°F to+120°F (10C to 50C). Nominal 80 Mil Thick, 4 Mil Aluminum Shield, Sound AND Heat Insulation, Massive DB & SPL Gains, Overlap Layers for Additional Vibration Dampening, Flexible, Pliable, Malleable, Kill Unwanted Noise, Rattles, Vibrations, Impressive Bass Improvement. GTMAT Sound Deadener is a self-adhesive insulator coating that consists of a black elastomeric rubberized compound laminated to a protective layer of aluminum. The product is produced in rolls and comes with polymer film release layer that is removed upon application. If you have any questions about this product by GTMat, contact us by completing and submitting the form below. If you are looking for a specif part number, please include it with your message.